i quickly made a contact form, but I don't know how to expand it to full screen on a contact page. Now around half of the screen is empty, how could I expand this? http://form.jotformeu.com/form/33136449800351? Hello. Thanks for posting your inquiry here on the forum. I did this, but then the colour in the theme and my previous work/settings are gonne. Probably I should just add this somewhere in the code, right? Yes, you are correct on that part about adding it. If it is your Contact form with Sky Theme, you want to make it full page including the background, is it correct? I already included there the above code to expand also I added a code to which the background will expand as well. Please read on How to Inject Custom CSS codes. I want to embed it to a wordpress blog to have as a contact form on landing page. I would like it to look great. I inserted the code you gave me, but the height is not on the full screen. Almost half of the screen is blank below. Can you please share to us URL of your website where your form is embedded for us to investigate the issue and for further assistance? Yes, it's better, I would just like to have form in the middle of the upper side of the page. It would be great if there was a tool to make landing pages (that would send me input to my email-not a squeeze page with autoresponder) and contact form with different pictures that I could change myself. The function to expand the form to full screen would be great. Regarding on your other request, please post it on a separate thread so we can assist you better. Sorry but we can only handle 1 question/request per thread. Thanks for your understanding. thanks for help, but it's not good. The fields are not in the middle of the page and the picture is not all around the page (the clouds). Picture is only on left and right and after I put it on my blog, it's even without a picture. Thanks for giving us the update of the situation. I continued what my colleagues added to the code and added some adjustments, please use this Custom CSS code and inject it to your form. Also please make your submit button to align to "Center" before using this code. this one was better, fields, buton and text just aren't on upper middle side of the page. 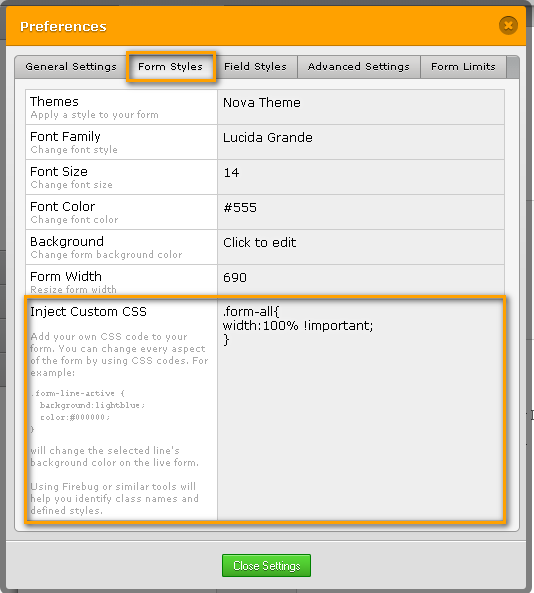 You can clone this form http://www.jotformpro.com/form/33153702739959 then. And re-embed it to your website. This way we can check the actual live form, and we can apply the required changes to match what need. Update us if further assistance is needed.